I’m not usually one to read poetry, I find its brevity unsatisfying. But I bought Karen Chase’s Jamali-Kamali not knowing it was of this genre, and was glad that I was forced out of my literary comfort zone. Jamali-Kamali is a long narrative poem recounting the love affair between sixteenth-century Mughal court poet Jamali, and his male lover Kamali. But more than just a poem, this book is a whole visual and historical account. A long introduction by art historian Milo Beach sets the context for Chase’s poem. The Jamali-Kamali tomb today lies off the Mehrauli-Gurgaon highway in Delhi, in the Mehrauli Archaeological Park, just south of one of Delhi’s most visited tourist sites, the Qutb Minar, but receiving far fewer tourists itself. It is intricately decorated with blue and red tiles and decoration, in a way that many of north India’s Mughal monuments must have once been, and is quite well preserved and maintained. Several photographs of the exterior and interior of the building accompany Beach’s short essay. The building contains two tombs, side by side, Jamali’s and Kamali’s. Jamali was a court poet of Sikander Lodi’s reign in the sixteenth century, but nobody knows who Kamali was. As Beach notes, legend and oral histories variously state that Kamali was Jamali’s pen-name, that she was Jamali’s wife, or that he was Jamali’s male lover. In the plump dusk, I hear/ a peacock screech,/ eye marks on my lover’s neck. Kamali, let’s go/ to the lake/ to moisten our love scars. I will wash mud from/ your muscled legs. My secrets rest/ in the wedding/ hut. I visit another/ man as the moon/ circles down. Come my protege,/ my Kamali, to bed./ I will show you/ moves of a new/ planet as no/ astrologer could. Gulping water./ Tuk tuk tuk–the owl. I am dismantled/like glass chips. 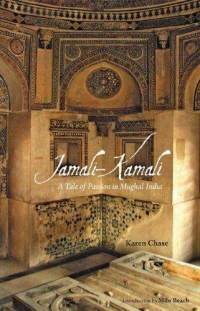 Jamali-Kamali: A Tale of Passion in Mughal India contains a beautiful poem, but as a book it is more than this. It is the sum of several parts–photography, historical essay, poem–that together, add up to an experience, a suggestion that history does not just lie in the known and the unknown, that the unknown can perhaps be imagined and put into words to become an alternate possibility.